Are you worrying about 6% GST? AskMeBuy will provide self-absorbed the 6% GST activity for said thanks to our loyal customers. This event will be proactive in responding to Penang Chief Minister Lim Guan Eng said that it would absorb the 6% GST start from July 1st, 2015. 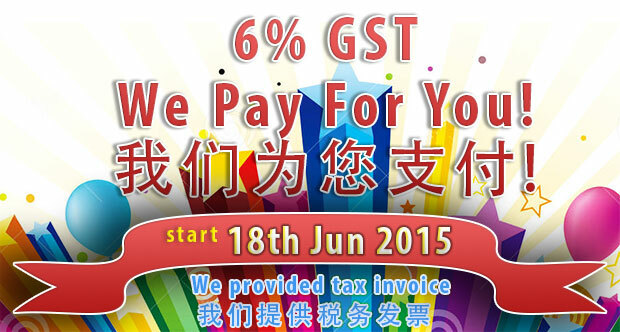 AskMeBuy will start the implementation of this activity from June 18th, 2015; start from June 18th, 2015 Submit NEW order or NEW shipment will not be charged 6% GST to customers, this 6% GST will absorb and pay by AskMeBuy. This activity wills helping the customers was always worried about payment of 6% GST! In market some of company said that will paid 6% GST for you but there are not provided the tax invoices which included 6% GST. It means this company is not willing to pay the 6% GST for you to our government. In order to prove that we are paid the 6% GST for customers, we provided tax invoices to customer and good for company used for submit their tax report. We give you best sales.